Fold brownies into softened ice cream. Spoon mixture immediately into graham cracker or chocolate pie crust. Cover and freeze until firm, 1 to 2 hours. Place pie in refrigerator 20 minutes before slicing. Whip cream until thick. 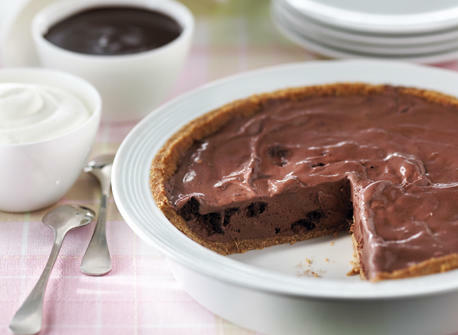 Serve each slice of pie with a dollop of whipped cream then drizzle with 2 tbsp (30 mL) of warm Decadent Chocolate Sauce. Combine chocolate chips and cream. Stir over low heat until smooth. Cool slightly. Serve warm. 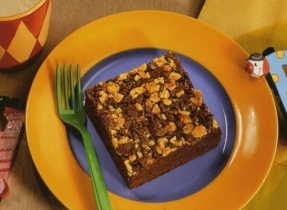 Replace brownies with 4 (40 g each) chopped milk-chocolate covered crisp toffee bars. Replace chocolate ice cream with vanilla ice cream. 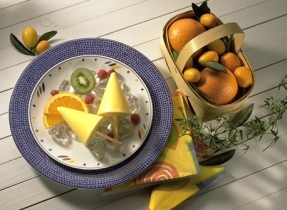 To soften ice cream, scoop it into a bowl and work with a spoon or mixer until it's just 'stirring'' soft. Do not melt.